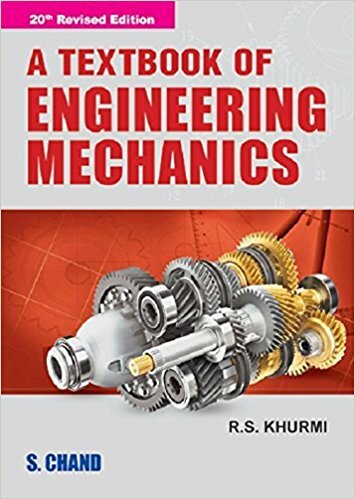 Engineering Mechanics Textbook By RS Khurmi: Engineering Mechanics is one of the major subjects of Engineering branches. Aspirants having the Engineering Mechanics in their 1st year can download Engineering Mechanics textbook PDF from our page to have the clear-cut knowledge of the subject. Candidates belong to various groups such as ECE, CSE, EEE, IT, Mech, ANE, Civil, AE, PCE and other branches can download Engineering Mechanics textbook PDF, which is very useful to attempt the examination with a clear understanding and to get a good score in the examination. Aspirants undergoing the 1st year Engineering can get the Engineering Mechanics textbook PDF for free of cost. With a simple mouse click, they can easily download Engineering Mechanics textbook and go through it. Each and every chapter has fully covered in this textbook. So, it will be most useful for candidates undergoing the Engineering Degree course. Engineering Mechanics is one of the toughest subjects in 1st-year subjects. Students must have a good practice of the Mechanics subject to clear the examination. Getting full score in Mechanics subject will be helpful for aspirants to get the good aggregate percentage in the examination. The Engineering Mechanics contains various topics such as different types of motion, Analysis of frames and trusses friction and application of work -energy method and other topics. Students must have the strong understanding and grip on all these topics to get the good score in the examination. I take an opportunity to present this standard treatise entitled as A TEXTBOOK of APPLIED MECHANICS to the Students of Degree, Diploma and A.M.I.E. (I) classes. This object of this book is to present the subject matter in a most concise, compact, to-the-point and lucid manner. A Textbook of Engineering Mechanics” is a must-buy for all students of engineering as it is a lucidly written textbook on the subject with crisp conceptual explanations aided with simple to understand examples. Important concepts such as Moments and their applications, Inertia, Motion (Laws, Harmony and Connected Bodies), Kinetics of Motion of Rotation as well as Work, Power and Energy are explained with ease for the learner to really grasp the subject in its entirety. A book which has seen, foreseen and incorporated changes in the subject for 50 years, it continues to be one of the most sought after texts by the students. 36 chapters evenly explain all major theories of the subject. Close to 1200 figures and examples aid to the concepts explained.